Filson Twin Lakes Sport Shirt. Made for hot days with ultralight fabric, ventilation and sun protection. 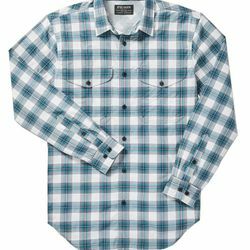 Filson's ultralight, quick-drying Twin Lakes Sport Shirt has a vented mesh back yoke and embroidered underarm grommets for breathable comfort in hot weather. An odor-resistant treatment and a UPF rating of 30+/50+ will make this your go-to shirt in the field.